When I think about summer one of the things that always comes to mind is a simple white dress. Even though you can totally wear white all year round, there is just something about a white dress and summer. They just go together. This one from Nordstrom was one of my favorites from this year. Mostly because it is so bump friendly, but I also love how it can easily go from dressed up to dressed down. This one is currently on sale too! 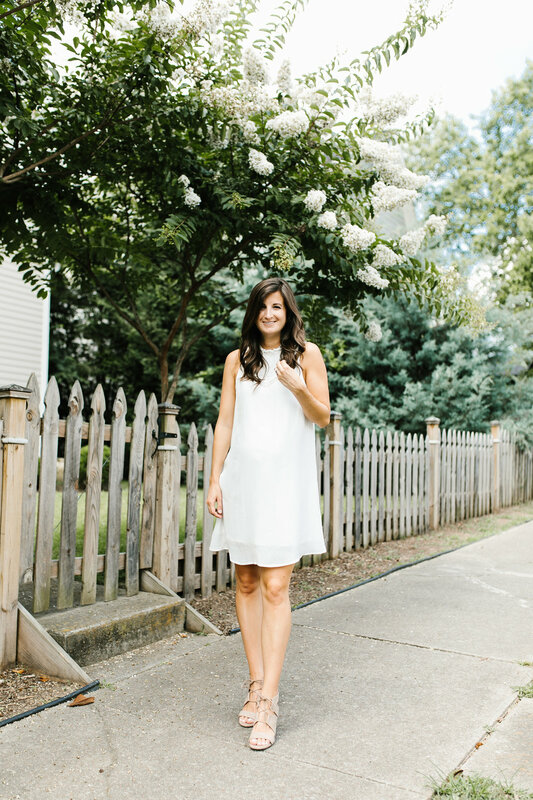 I have listed some of my top white dress picks below. A good white dress only comes around every once in a while. One of the things I constantly work on in my relationship with Christ is letting Him be in control. I am sure I am not alone in this. I spend my days praying for Him to make certain things work out on my time. As each event unfolds, my prayers will become more dyer to have things work in my direction. Instead of taking the time to listen to what He might be trying to tell me. We can try to control our plans, but ultimately they are in God’s hands. Something we know yet often have to remind ourselves. I know He attempts to tell me this on a daily basis. And even with those reminders, I still find myself trying to control His plan. Every once in while, when I go to pray the words “just be still” will come through so clearly. It is as if He is screaming them into my brain. I’ll begin to pray for things to work out a certain way and suddenly God interrupts me with this command. More than ever before I have been hearing those words over and over again. Realizing I need to trust in His timing has never been so apparent. Mostly because I am anxiously awaiting the arrival of our little one. But I also know He means it in so many other areas. So for now, I am doing just that. Being still. Trusting in Him to know where the next steps are. To know the exact date when she will arrive. And to know He will lead me through the paths that are presented before me. Final two days of the Nordstrom Anniversary Sale. Can I get an AMEN?! I know y'all have been hearing about it for weeks. In all seriousness, this sale really is the best of the year. Tons of fall pieces that are discounted now and prices will only go up later. I personally think it is a great time to invest in those shoes you will be wearing once the weather gets colder. Below are final picks for the sale. But you can always shop my other favorites by visiting the Nordstrom Sale tab. Just scroll over each item to see the price and shop! Happy weekend and Happy shopping! With it being summer, and lots of extra time spent outdoors, I've teamed up with COOLA Suncare to tell you how you can stay protected from the sun. I am not usually one to use a spray sunscreen but the Eco-Lux Sunscreen Spay SPF 50 Guava Mango is different from all the others. Part is because it smells amazing. But the other reason is it does not go on sticky. I feel like I can spray and be done! It also offers amazing protection. Being pregnant, my skin is extra sensitive to the sun. So finding a product that will still allow me to get that sun-kissed glow, and protect me from the harmful rays, is super important. I also love the light weight feel of the Face Sport SPF 50 White Tea Moisturizer. The best part about these products is they are made with lots of organic ingredients. If you are headed out to the sun I highly recommend using COOLA for your protection. Our skin isn't the only thing we need to protect this summer. We also have to take time to protect ourselves. Especially protect our hearts just like it reads in Proverbs 4:23 "Above all else, guard your heart, for everything you do flows from it." Our heart is an important muscle that has to work in order for our bodies to function. But it is also where we associate the feelings of love and pain. We can feel our heart beating in our chest at different speeds that let our brains know what we are feeling. Excitement, scared, nervous, content - all come in different types of patterns and speeds. And it is associated with how we feel in that situation. So God wants us to protect it. But how? When God says to guard and protect your heart, He isn't saying to stay at home and never feel anything. He wants you to love. He wants you to put yourself out there. He wants you to have experiences and learn from them, even if He knows they are going to end in heartbreak. He still wants this for you. Why? Because He knows that each time you love with your heart you are growing in the path He has for you. Guarding your heart simply means to remember who actually has it. Jesus holds your heart in the palm of His hand, so closely to His own. Allowing you to recover even when the pain seems so strong it could never go away. But He can't begin to repair it if you don't trust in what He will do to restore it. I have had my heart broken. I have seen it restored. I have learned to trust again in situations I never thought possible. But I also know enough about life, and have watched too many people close to me experience it, to know that there will be greater heart break up ahead as I continue on this path Jesus has placed me on. So in order to prepare, I have to start trusting Him now. When times turn bad, I know His love for me will be an easy thing to forget. But I pray that my broken heart will be held together by enough strings to remember how strong He actually is in every situation. I pray that for you too. No matter what season you are in. I pray you are able to guard your heart from the voices and situations that want to rip it apart. I pray that you remember your heart carries the greatest shield ever and that is the love of Jesus. This post was sponsored by COOLA Suncare. Opinions are my own. All products were selected by me. Thankful for partnerships like these to make a TAD more faith possible.